8 mm round beads of snowflake obsidian. 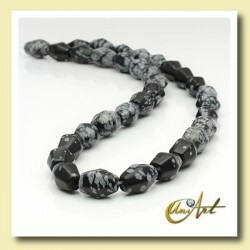 Each strand of 8 mm snowflake obsidian round beads has about 48 obsidian beads size 8mm. 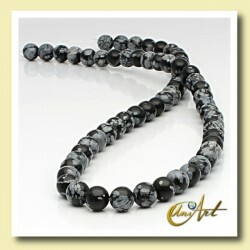 The strands of 8 mm snowflake obsidian round beads measure about 40 cm and weigh around 33 grams. 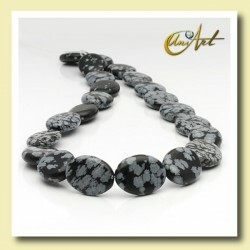 The snowflake obsidian is a semiprecious stone that can be used both for costume jewelery and jewelry. Strand of snowflake obsidian 6 mm round bead. 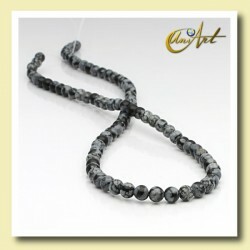 Each strand has about 65 snowflake obsidian 6 mm round beads. 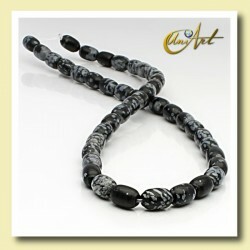 The average size of the strand of snowflake obsidian 6 mm round bead is 40 cm and weighs about 20 grams. A snowflake obsidian is a black semi-precious gemstone that contains white and gray spots that resemble snowflakes. Strand of snowflake obsidian 4 mm round bead. The 4 mm snowflake obsidian round beads are presented in strands around 40 cm, weight of each strand is about 40 grams and have about 97 pices of 4 mm snowflake obsidian round beads. These beads are excellent for assembling necklaces and bracelets. Strand of snowflake obsidian bead rhombus shape. The approximate measurements of each Snowflake obsidian beads rhombus format is 12 mm x 8 mm. Are presented in strand about of 40 cm, They are presented in strip about 40 cm, weighing around 40 grams and each strand has about 33 snowflake obsidian beads. 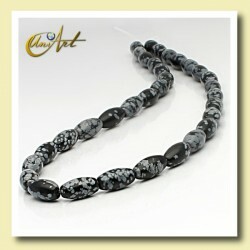 Strand of snowflake obsidian bead oval shape. Snowflake obsidian beads oval format measuring approximately 18 mm x 13 mm x 5 mm. They are presented in strand of 40 cm average, weighing about 40 grams and containing approximately 22 beads of snowflake obsidian. Strand of snowflake obsidian bead pear shape. Pear shape beads of snowflake obsidian is approximately 12 mm x 8 mm. 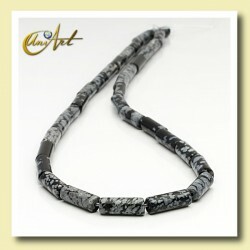 Each strand measures on average 40 cm, weighing about 38 grams and have about 31 accounts of snowflake obsidian. 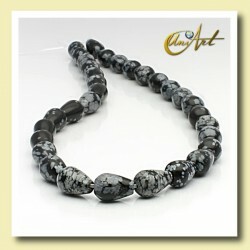 Strand of snowflake obsidian bead olive shape. These are olive shape beads of snowflake obsidian, each measuring about 12 mm x 6 mm. Beads of snowflake obsidian are presented in stands, each strand measuring approximately 40 cm, weighs about 45 grams and contains about 33 accounts. Strand of snowflake obsidian bead lentil shape. These are beads of snowflake obsidian carved in lentil shape measuring about 10 mm x 5 mm. 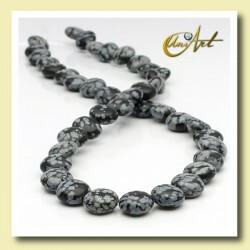 Snowflake obsidian beads are presented in strands about 40 cm, each weighing about 37 grams and about 39 beads each. Strand of snowflake obsidian bead drum shape. Beads of snowflake obsidian drum shape measure about 9 mm x 6 mm. Each strand of drum shape snowflake obsidian is approximately 40 cm, the average weight is 30 grams and it takes about 45 beads. Strand of snowflake obsidian bead cylinder shape. Each strand of snowflake obsidian cylinder measures about 40 cm and has approximately 30 beads, the average weight is 18 grams. Each bead of obsidian snowflake measured about 12 mm x 4 mm.